Police on Sunday arrested a 54-year-old man dangerously riding an electric bicycle on the sidewalk of Jerusalem Boulevard in Jaffa. After questioning, the cyclist told police officers that he drank "a small glass of vodka" before riding off. However, tests indicated that there were 725 micrograms of alcohol in his body - three times the amount permitted by law. Moreover, it was revealed that the man had his driver's license revoked in 2006. 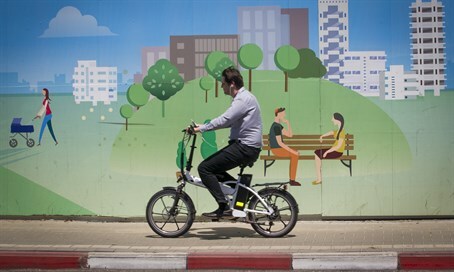 This comes as new enforcement operations against electric bike riders began Sunday morning in Tel Aviv. According to the new law, city traffic inspectors may now fine or penalize electric bicycle riders who violate traffic regulations or travel in a careless manner. Such violations include riding on the sidewalk, riding through a red light, riding against the direction of traffic, using a mobile phone while riding, and interfering with pedestrians at crosswalks. Punishments include a fine ranging from 100-1,000 shekels ($27-$270), or, should it be needed, removing the air from the tires and confiscation of the bike's battery.